Click here for direct link to audio Episode #2. Like most writers, I am a fiend for books and paper, and find it difficult to keep up with it all. So today, I organized my work space for maximum efficiency and came across a slip of paper with this note written in my handwriting: “Epipole of Carystos, daughter of Trachion…wanted to go to Troy with the Greeks—was stoned to death.” Just something I ran across in my research that I wanted to know more about. There are so many tales related to The Iliad, that study of the cycle of stories could easily take over one’s life. In the editorial process, some great tales I’d written up never made it into the book I did for Scholastic. 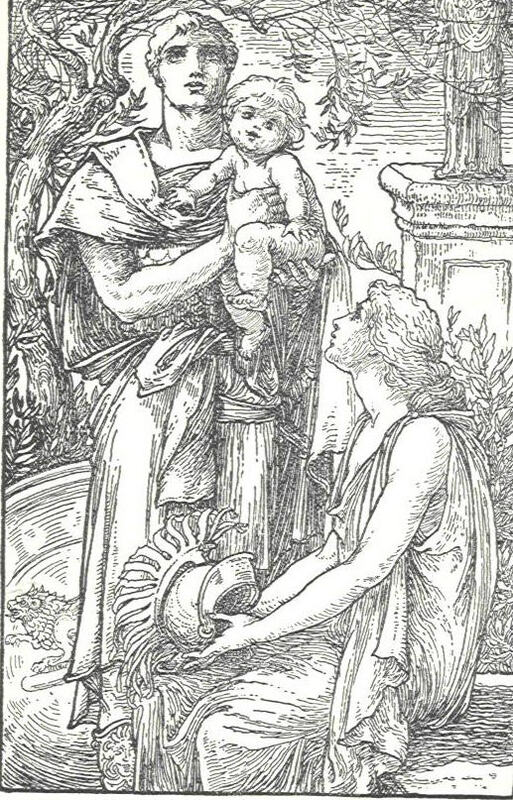 Here is one of them, a very sad tale of the young newlyweds, Laodamia and Protestilaus. 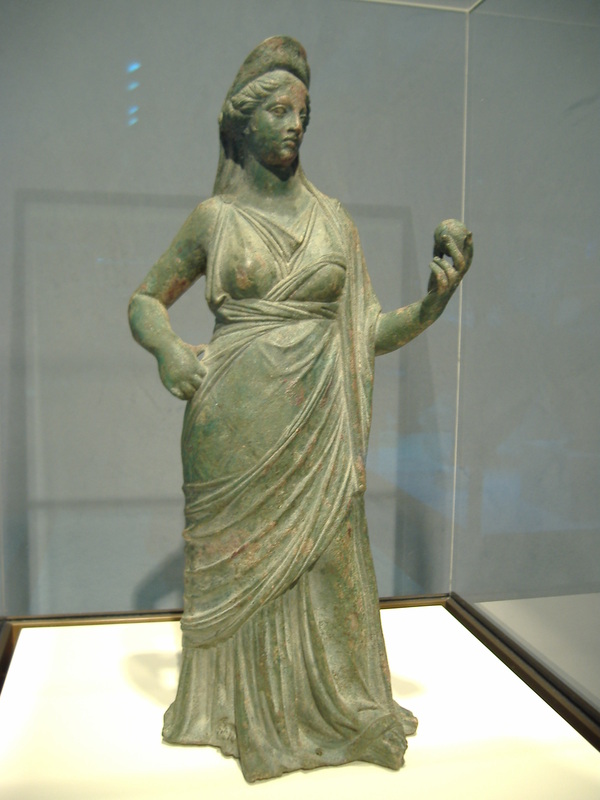 Laodamia was the new wife of Protestilaus, a Greek warrior sent to fight at Troy. It was prophesied that the first soldier to step foot on Trojan soil would be the first to die. Protestilaus, seeing great honor in being the first to die for the cause, leaped from ship to shore and was slain immediately by Hector. 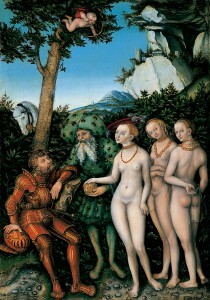 Laodamia had only been married to him for one day. She so mourned her loss that the gods took pity on her and allowed her to see him for three hours before he proceeded to the Underworld. When she saw him, she fell into his arms, plunged a dagger through her heart, and accompanied him to Hades. Enjoy today’s podcast. We finish up The Iliad next Monday and then begin on The Odyssey! Click here for up-to-date list of all podcasts. I can’t do math to save my life! It is no surprise that I counted wrong! But who’s counting?!!! to the Heinrich Schliemann saga……One morning, so the story goes, Sophia & Heinrich went to the site where their workers were digging. They had laid bets that in this one particular spot on the Greek mainland, Agamemnon’s Mycenaean kingdom had stood and prospered. As they were approaching the work site, Sophia caught a glint of gold. Thinking fast, she declared, by George, that it was Heinrich’s birthday, (how could they have forgotten) and all the workers had the day off! When the workers cleared off, the couple dug up one of the most important archaeological treasures ever to be recorded. 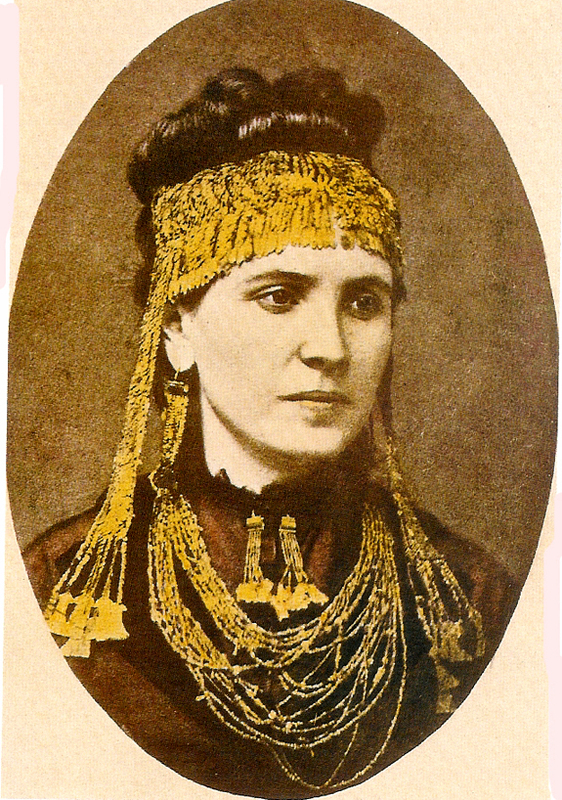 Sophia donned the gorgeous gold jewelry, they took pictures and notified the press, and a firestorm of renewed interest in the ancient world (picking up where eighteenth century discoveries of Herculaneum and Pompeii left off) immediately swept the globe. This photograph inspired designers to fashion jewelry in the old, old styles, and nineteenth century ladies fell all over themselves trying to keep up with the new trend. Okay, now to the podcast…drumroll, please…..I am crossing my fingers that this works properly, but as with all things tech, there’s bound to be a glitch. Let me know what you think! And contact me ASAP if something is amiss. From here on out, podcasts will be available every Monday. Thanks to everyone for your help and support. Let’s roll! 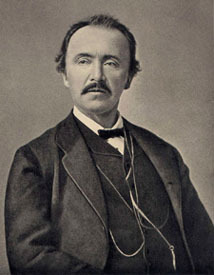 From the time Heinrich Schliemann was a wee lad in Germany, he dreamed of finding the location of legendary Troy. He dedicated his entire life to this dream. He came to America and made a gold rush fortune out west. He did the mail-order bride thing and hooked up with a Greek girl named Sophia, who was also a big fan of all things Homeric. Together, they combed Greece and Turkey in the hopes of locating Ilium. While Heinrich has a bad rap in today’s world for his rough & tumble archaeological practices, you gotta hand it to him, the man was passionate! Tomorrow I’ll tell you about his young wife, Sophia, and show you how she influenced ladies accessories in the mid-nineteenth century. Tune in to the maiden podcast of Ancient World Now to see what inspired these two characters! Who was Paris? And how did he get so lucky? Goddesses! Helen! Playing the lyre whenever he wanted! Hanging out in the palace while everybody and his brother fights his battles (literally)! Little did you know that he was callously cast aside, nay, exposed on a mountaintop, soon after birth because his mom had a nightmare that he would bring down her family! Some time later he was picked up by a shepherd who raised him to manhood. But discovering he was a hot young swashbuckling prince of Troy is another story. 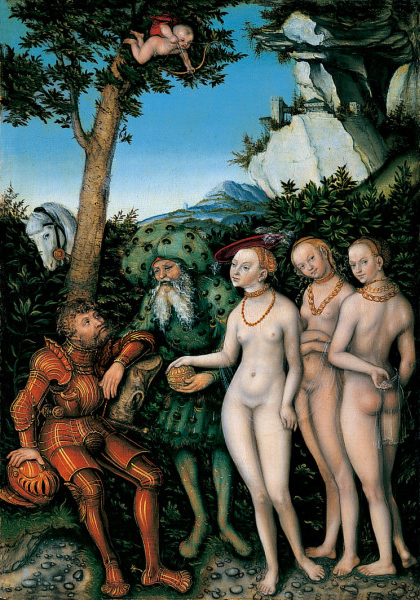 This Judgment of Paris by Lucas Cranach the Elder is from around 1528. If you want to see it “in person” you’ll have to go to the Metropolitan Museum of Art in New York. Find out how these three ladies tried to bribe Paris and what they used to entice him in the maiden podcast of Ancient World Now! Of course Aphrodite was deemed “the fairest”! 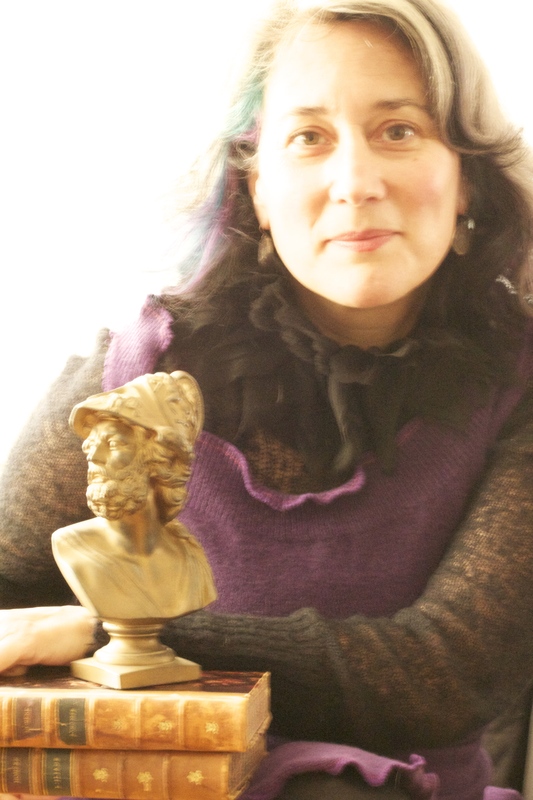 And here she is with the golden apple. Here Aphrodite wears the fashion of the Hellenistic period (323-31 BC): platform sandals and a sheer cloak that reveals her undergarments and the contours of her body. In her outstretched hand she holds the apple that Paris, a Trojan prince, awarded her as a prize in a beauty contest with Hera and Athena. 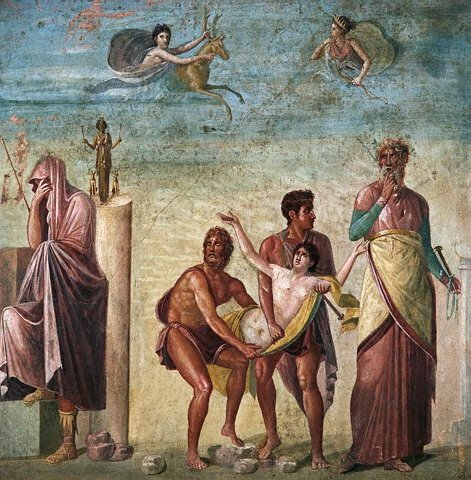 This contest eventually led to the most famed conflict in antiquity, the Trojan War. Text from the Getty Villa museum label. you are my brother, and you it is who are my young husband. that you may not leave your child an orphan, your wife a widow….. 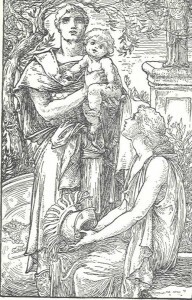 The baby cries with fear at the horsehair crest on the peak of Hector’s helmet. Hector, laughing, takes it off. One of the most poignant scenes in The Iliad. Find out the fate of Hector, Prince of Troy, in the maiden podcast of Ancient World Now. n’est pas? Who was deemed “the fairest”, Hera, Aphrodite, or Athena? Find out next Monday in the first episode of The Iliad. 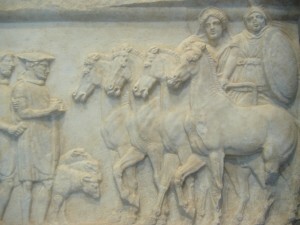 This marble relief is from the Getty collection. Achilles and his mother are in a chariot and approach a group of worshippers along a road. The three rams are for sacrifice to Achilles. This piece is thought to be from Thessaly, where Achilles was born. Scholars believe he was worshipped there. Because Achilles was born of a mortal man and an immortal goddess, he was destined to die. However, Thetis did everything she could to keep him from harm. We refer to a person’s weakness of strength or character as their “Achilles’ heel”. Find out why in the first episode of Ancient World Now. This tiny Greek figure is from the British Museum’s collection. 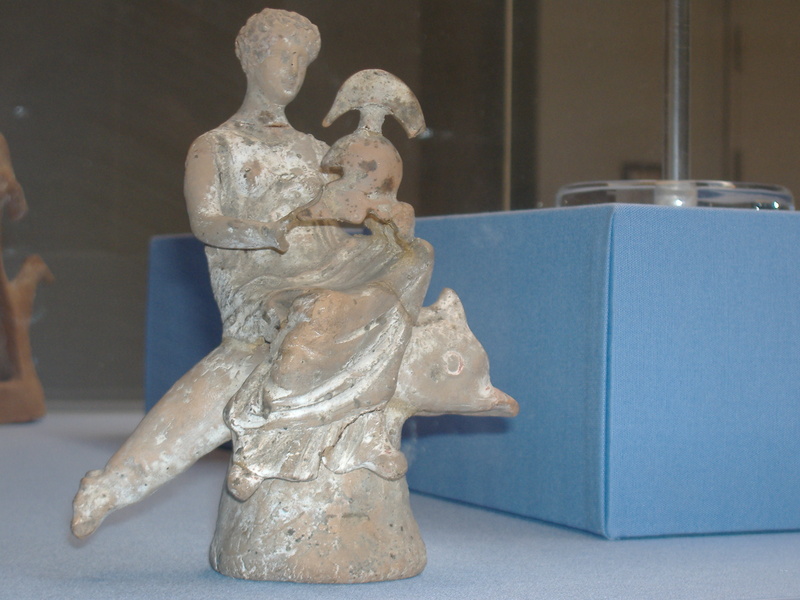 The Nereid goddess Thetis, mother of Achilles, is riding a dolphin buoyed up on the crest of a wave. She carries the arms of Achilles, newly fashioned by Hephaestus, god of fire and metal. W.H. Auden wrote “The Shield of Achilles” (1952) in response to this passage from The Iliad. Why was new armor made for Achilles? What was so special about this armor? Find out in ten days on the maiden podcast of Ancient World Now…. « Older posts « Ancient World Now….eleven days…..